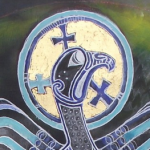 For all archive updates of AOIBHEALL’S FLIGHTS, please consuly “EAGLE LOG’ in menu bar. Courtesy of Golden Eagle Trust. January 2015. Aoibheall is now moving up the Shannon and is just in the south on Offaly south-west of Banagher. She’s been there the past week after a long spell around Portumna. Lots of flooded areas round the Shannon so should be good hunting. December 2014. Over the last four and a half months or so since she took her first flight from her nest high up in a Scots Pine near Mountshannon, Co. Clare, its been fascinating to see the 2014 WTSE chick Aoibheall explore her watery environment on beautiful Lough Derg. 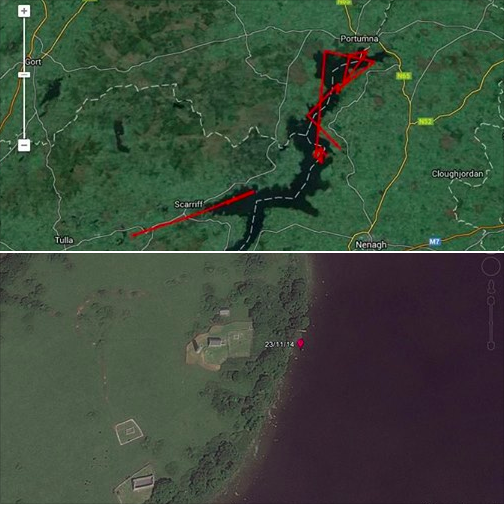 Over the first four months she has been pretty much a ‘homebird’ staying within a kilometre or two of her natal area most of the time and only very occasionally (13-15 Oct) roosting away from Mountshannon. All that began to change in late November. On 23/11 she roosted for the very first time on Inis Cealtra (Holy Island) within a stone’s throw of the ancient round town and monastic settlement founded originally back in the late 7th Century by St. Caimin (hence the name of Aoibheall’s male parent!). Perhaps she was looking for the ancient ones blessing before she headed off on her travels? !